Mountainous landscapes, charming villages, and a passion for coffee and cake are just a handful of reasons why paying a visit to Austria is a must for those hoping to travel to Europe one day. Here are a few more reasons why for those who need a bit more convincing. Vienna has been named the ‘city with the best quality of life’ 8 times in a row by consulting firm Mercer. Low crime rates, clean air, cheap rents, and a rich culture are a few of the reasons why it has been given this accolade. The great outdoors beckons in Austria, and hikers will adore what the countryside has to offer. Trekking across the regions around the Tirolean Mountains will take hikers around some of the most striking landscapes. ‘The Eagle Walk‘ is one of the most famous routes, taking people across over 400 km (248.5 miles) of natural beauty. Throughout the 19th century, Vienna was a powerhouse of art, music, and culture. The legacy from those golden years still live on. Klimt, Mozart, Wagner, Schubert, and Strauss are just a few of the creative names that Austria has produced, and their lives and works are preserved in some of the finest museums and galleries in Europe. Considered to be Austria’s cultural heart, many cities other than Vienna are also developing creatively. Salzburg’s Museum of Modern Art has become a go-to contemporary-art gallery, and its music scene (classical and modern) thrives. Sweet-toothed visitors to Austria, beware. Virtually every street in Austria contains at least one bakery. The self-proclaimed capital of cake, Austrians are so passionate about their confectionery that legal battles have ensued over the right claim the title of ‘The Original Sacher Torte.‘ Between 1954 and 1963, Café Demel and Hotel Sacher were embroiled in a spat over the chocolate sponge, both wanting to call their version ‘the original.’ They eventually settled the case out of court with Sacher coming out on top. Be sure to try a slice in one of Vienna’s coffee houses—uniquely-atmospheric institutions that people won’t find elsewhere. Relatively small, visitors can hop from city to city across Austria and stop by the countryside on the way. The bus and train routes offer relatively inexpensive and stress-free rides, and all of the major cities (Vienna, Linz, Graz) are well-connected. Road trips will give tourists the chance to see gorgeous natural landscapes one day and idyllic cities the next. The Alps surrounding Austria provide a skier’s paradise. Many natives and tourists head to the hills at least once a year to partake in a little gliding, slipping, and sliding. They do so for good reason—wide, quiet runs, fantastic après ski, and all for a fraction of France or Switzerland’s prices. 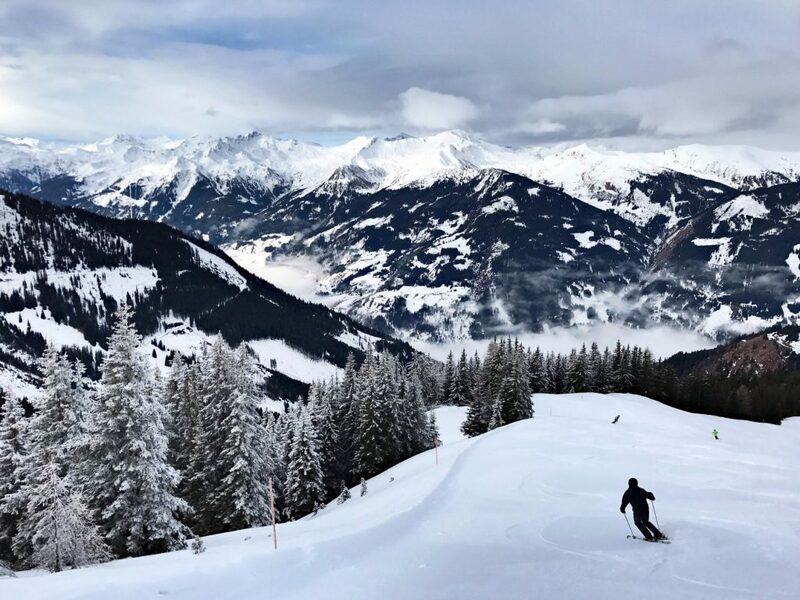 Albach, in Tyrol, is one of the most picture-perfect destinations skiers will find—so sweet that it resembles a model village in a snow globe with its wooden chalets with glowing orange windows and traditional inns. From the Austro-Hungarian Empire to WWII, Austria’s past is complex and at times, dark. Once considered the ‘capital of Europe’, the Austro-Hungarian Empire was a domineering force from 1867 until its collapse after WWI. Following the dismemberment of the Habsburg Monarcy in 1918, the Austrian government acquired many of the palaces, gardens, and castles that once belonged to the ruling emperors and turned them into public spaces and museums that act as amazing relics and remnants for tourists to examine. Flak towers left over from the Nazi’s reign also remain dotted around Vienna, a stark reminder of the devastation caused during WWII. Providing dainty-wooden-alpine-style houses, lush meadows, and glittering lakes, Austria offers much to explore beyond Vienna, Graz, and Linz. Hallstatt is a favourite and must-visit for many. Located directly by a lake in the mountainous UNESCO World Heritage region of Salzkammergut, its beauty is such that the ancient salt mine has been replicated by the Chinese. Across Austria, the architectural styles are spectacularly diverse. The so-called ‘Red Vienna’ era—between 1918 and 1984—saw a surge in social housing crop up around the city as a result of the Social-Democrat government. Many of the buildings designed around this time were considered highly innovative and forward-thinking, with architects such as Otto Wagner leading the way. Situated in Heiligenstadt, a neighbourhood of the 19th district of Vienna, the Karl-Marx-Hof—often referred to as a ‘people’s palace’— is one such building. Fantastically located right in the heart of Europe, Austria borders Slovenia, Slovakia, Switzerland, Czechoslovakia, Hungary, and Germany. It is also a relatively-easy bus or train ride to the sunny shores of Croatia and Italy. Those wandering around the continent on a backpacking tour don’t really have an excuse not to pay a visit to Austria, even if it is a fleeting one.